How can beer save the world? Our friends at Toast Ale know a thing or two about making beer, but it’s not your average pint… they share their thoughts with us for our final day celebrating the power of food. We have become a nation of foodies. We enjoy some of the best restaurants in the world, we cook delicious meals at home with guidance from a plethora of best-selling cookbooks, TV chefs and even meal kits that portion our ingredients and guide us through beautiful recipes. Yet over 1.1 million people rely on food banks. This is a shocking statistic, particularly in a food system designed to oversupply and therefore inevitably waste huge volumes of edible food at every stage. At the farm level, farmers are often left with no alternative but to leave crops to rot or to plough it back into the soil when supermarkets’ overly strict cosmetic standards cause it to be rejected. At the retail level, supermarkets overstock to present consumers with abundant choices that encourage people to buy more than they need. In restaurants, plate scrapings that may have once been fed to pigs now end up in landfill because we’re too ashamed to ask for a doggy bag. And in our homes, we waste food that has passed unnecessary best before dates even when it’s perfectly edible. In addition to the social injustice of food waste, there are massive environmental impacts. Humanity’s biggest impact on the environment is through food production. It’s responsible for 80% of deforestation, 70% of freshwater consumption and 30% of greenhouse gas emissions. Yet one-third of all food produced is wasted. We are destroying the planet to produce food that no-one eats, whilst millions go hungry. Clearly our food system isn’t working. With increasing awareness of the problem – thanks partly to media exposure such as Hugh Fearnley-Whittingstall’s War on Waste and the Evening Standard’s recent #FoodForLondon campaign – comes a force for change. A wave of charitable and entrepreneurial organisations are proving there is an alternative. From Winnow Solutions helping commercial kitchens to reduce waste, to Rubies in the Rubble and Snact using surplus produce to create new, delicious products, to pay as you feel shops and cafes like The Real Junk Food Project and Community Shop. There are also a number of redistribution organisations like Fareshare, City Harvest, and Plan Z Heroes collecting surplus food and FoodCycle, People’s Kitchen and food banks ensuring it reaches the people who need it most. Toast is part of this exciting new movement. We source bread from bakeries and sandwich makers that would otherwise go to waste and work with expert brewers to brew really good beer. All our profits go to the food waste charity Feedback. We chose to tackle the UK’s most wasted household food item – we bin 24 million slices every day. Across the whole food chain, 44% of all bread produced is wasted. In fact, there is so much waste that even redistribution charities are unable to use it all. Supermarkets overproduce because people expect fully-stocked shelves. It’s a low-price loss-leader that entices shoppers through the door, so wastage is commercially more acceptable than selling out. As bread has a short shelf-life, surplus is discarded at the end of the day. There are also the parts of the loaf that no one wants. What do you think happens to the heel end of loaves when pre-packaged sandwiches are made for retail shelves? Primarily because we love beer, but it’s also a perfect fit with our mission. Beer is a long life product, preserving the calories in bread through the age old process of fermentation, and therefore won’t itself be wasted. It is consumed in high volumes so offers the opportunity to use meaningful quantities of surplus bread. There are also wider benefits. Upstream, we replace one third of the virgin grain that would have been grown specially to produce beer. Downstream, our spent grain goes to animal feed to reduce the need to grow grain just to feed animals (check out the Pig Idea for more on this). We want to bring people together to spread awareness of food waste and celebrate the simplicity of the solution – that we just need to eat (or drink) the food we are producing. Beer is an excellent medium to spread that message and it certainly gets conversation flowing. 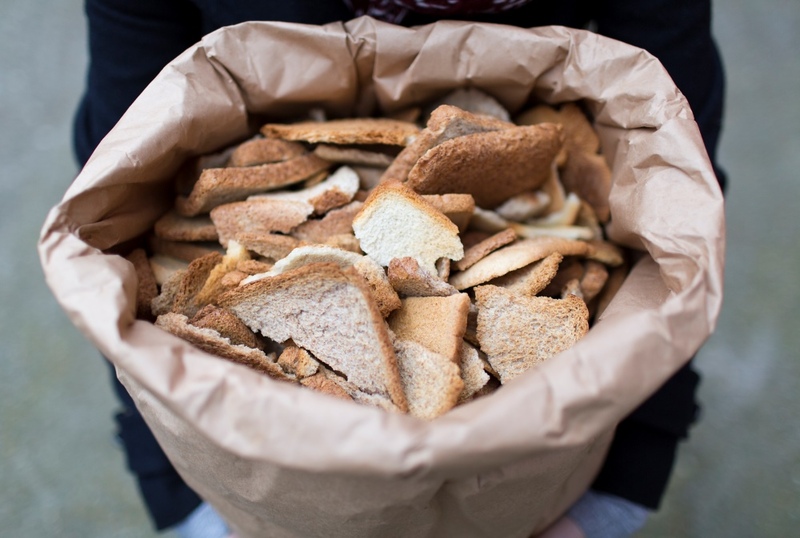 People are initially surprised to hear our delicious beer is made with bread, then shocked to learn why, and finally empowered to know that they are doing their bit. It’s a simple message in a bottle. Since we launched in January 2016, we’ve rescued 1.4 tonnes of bread and brewed 15,000 litres of beer. It’s fantastic but just a small bite out of a breadful problem. We knead beer-drinkers, homebrewers and craft breweries to join us to do more. The Big Lunch was started by the Eden Project in the belief that we, as a society, are better equipped to tackle the challenges that we face when we face them together. We’ll raise a Toast to that. Check out what Toast Ale are up to on Twitter and via their website www.toastale.com. We chose to tackle the UK’s most wasted household food item – we bin 24 million slices every day. Across the whole food chain, 44% of all bread produced is wasted.